Copyright, 1890, by Ike Kroch. To celebrate the opening he gave a fancy ball. The walls were full of showy signs, "Welcome to one and all;"
"Fried bologna juice, thirteen cents, And with it goes a hall;"
"An axe we give with every steak! " "Here corned beef has the call;"
They'll paralyze your appetite at "Reilly's Cutlet Hall." "'Pon my soul, Reilly, you're looking fine to-day,"
And Reilly's always ready with a smile for one and all. 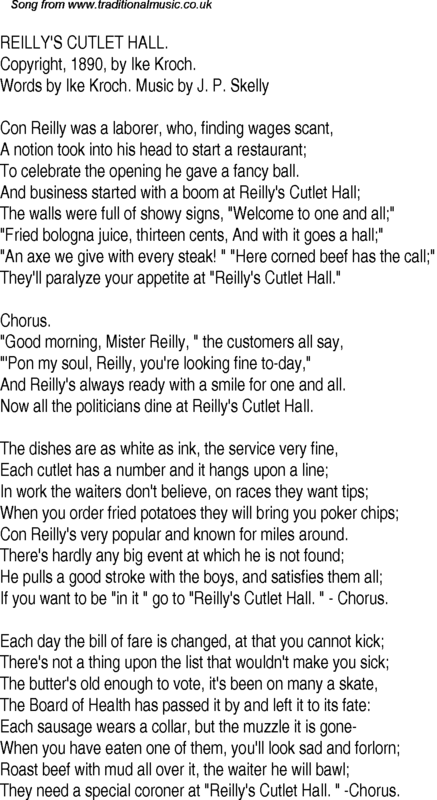 Now all the politicians dine at Reilly's Cutlet Hall. Con Reilly's very popular and known for miles around. If you want to be "in it " go to "Reilly's Cutlet Hall. " - Chorus. They need a special coroner at "Reilly's Cutlet Hall. " -Chorus.